Jane McGarry has new cover/profile photos on her Facebook page. Readers of unclebarky.com and anchor Jane McGarry's Facebook friends keep inquiring about her status following a DWI arrest early this month. McGarry remains mum -- verbally at least. And NBC5 spokesman Brian Hocker said via email Wednesday that there's nothing new on the McGarry front after the Fort Worth-based station took her off the air indefinitely a day after the incident. She's now in her fourth week of not co-anchoring weekday 5 p.m. newscasts and not soloing on the 6:30 p.m. newscast for NBC5's 5.2 digital channel. But in a perhaps symbolic gesture, the 30-year NBC5 veteran lately has removed her anchor-standing-next-to-a-green-screen pose at the top of her Facebook page and replaced it with the above two photos. Is she newly determined to keep smelling the roses and maintaining an upbeat demeanor during this difficult time? Might she be putting NBC5 behind her and moving on? Or is Jane just being Jane again while expressing full confidence that she'll be back on the air again? Some of McGarry's Facebook loyalists are getting a tad impatient. Says Stoney Reynolds: "HELLO . . . . . EVERYONE WANTS YOU BACK!!! WATCHA WAITIN FOR?!?!?" Others continue to offer unswerving support. Says Lynn Smith Diaz: "I have officially boycotted Channel 5 completely till I see your sweet face back on my TV or at least hear what's going on & that you're okay & coming back soon." Others say she should just jump ship, as if that's easy as pie. Says Darla King Martinez: "Jane, it would be sooo cool if you said f the douchebags and went to work for Ch. 8 . . . . just my thoughts. :)"
And David Kelley is still championing a silly Dallas Morning News online anchor popularity poll posted on May 8th to take advantage of McGarry's suspension. "The contest is still open . . . keep voting!" he implores. For the record, McGarry's NBC5 colleague, Meredith Land, still holds the top spot with 38.23 percent of the vote while McGarry is a close second at 36.04 percent. Meanwhile, the DMN's across-the-street Belo corporate cousin, WFAA8, barely registers with anchors John McCaa (2.7%), Gloria Campos (1.91%) and Cynthia Izaguirre (.82%), who's on maternity leave. This is the same poll, though, that lists WFAA8 medical reporter Janet St. James as an anchor (she's only an occasional fill-in), misspells Fox4 anchor Steve Eagar's name (it's not "Eager") and leaves out the ongoing hottest and most heavily promoted anchor in the D-FW market, Ron Corning of WFAA8's fast-rising Daybreak. Among other gaffes and omissions. 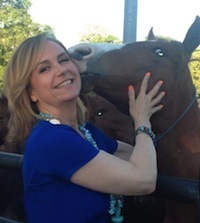 But back to McGarry, who also has changed her Twitter page photo from the NBC5 anchoring pose to the one with her happily in the company of an affectionate horse. She otherwise hasn't tweeted since May 5th after firing off 13 tweets the previous day. And that's all we've got for now. Even a 10-3 pasting from the Seattle Mariners couldn't derail the Texas Rangers' ratings express. They again were prime-time's most-watched attraction Tuesday, averaging 230,319 D-FW viewers on Fox Sports Southwest in easily outpointing the competing Game 2 Western Conference Finals series on TNT between the San Antonio Spurs and Oklahoma City Thunder (182,901 viewers). In the Big Four broadcast network universe, CBS' 7 p.m. NCIS rerun drew the biggest prime-time crowd with 196,449 viewers. NBC's 8 p.m. hour of America's Got Talent was the most-watched broadcast network entry among advertiser-prized 18-to-49-year-olds. But Spurs-Thunder were the overall top draw in this key measurement, with Rangers-Mariners ranking third. ABC's two-hour Katie Couric special on the Royal Family had a halfway decent 135,482 total viewers in the 8 to 10 p.m. slot. In Tuesday's local news derby results, WFAA8 won the first half-hour of its extended, election-infused 10 p.m. newscast in both total viewers and 25-to-54-year-olds (the main advertiser target audience for news programming). NBC5 had a doubleheader win at 6 a.m. while the 6 p.m. competitions had Fox4 and CBS11 tying for first in total viewers and Fox4 prevailing with 25-to-54-year-olds. At 5 p.m., NBC5 and WFAA8 shared the total viewers lead, with WFAA8 alone on top in the 25-to-54 demographic. Former NBC5 sports anchor Scott Murray is hosting a new Sunday night show on KLIF radio (570 AM). The Scott Murray Program, which launched on May 27th, airs weekly at 7 p.m. The station says it "will focus on difference-makers, individuals and groups who give back to the local community and discuss the importance of giving back to those who find themselves in need. "We'll be talking to your favorite athletes, entertainers and other well-known personalities who are always willing to lend a hand," Murray says in a publicity release. Murray also is chairman/CEO of Murray Media and hosts Talk Street, a public affairs/philanthropic program airing on NBC5's 5.2 digital channel, NBC DFW Nonstop. 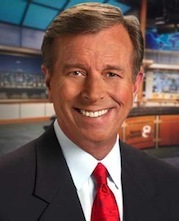 He was a sports anchor at NBC5 from 1982 through 2002, with most of those years as the featured attraction until Newy Scruggs arrived in 2000. Four straight sellouts. Four straight wins. Four straight dominating days in the D-FW Nielsens. The Texas Rangers ranked as the most-watched TV attraction throughout the Memorial Day weekend, during which they swept the Blue Jays and then won game one of their home series against Seattle. That's unprecedented prosperity for the North Texas Nine -- at least during the regular season. Friday night's game on TXA21 averaged 291,286 viewers, nearly doubling the crowd for CBS' runner-up Blue Bloods rerun (155,804 viewers). Saturday's elongated afternoon game on Fox Sports Southwest, climaxed by Josh Hamilton's walk-off home run, drew 189,675 viewers after a slow start that peaked as high as 338,705 viewers during extra innings. ABC's prime-time Game 7 of the Boston-Philadelphia playoff series came in second with an overall average of 162,578 viewers. The Sunday afternoon Rangers-Blue Jays game on FSS averaged 237,094 viewers. TNT's first game of the Spurs-Thunder Western Conference finals made it close with 223,545 viewers in prime-time. CBS' final round of The Colonial limped in with 74,515 viewers. The Rangers' Memorial Day win over Seattle had a nighttime FSS crowd of 318,383 viewers. ESPN's directly competing Game 1 of the Miami-Boston Eastern Conference finals was no match with 149,030 viewers. In the Big Four broadcast network arena. NBC's America's Got Talent was tops with 189,675 viewers. Again, a comparative pittance compared to the Rangers. All of D-FW's major local news providers took designated holiday knees on Memorial Day, save for WFAA8. So need to report the outcomes. In Friday's deflated local news derby results, CBS11 ran first at 10 p.m. in total viewers but NBC5 won among 25-to-54-year-olds, the main advertiser target audience for news programming. The other competitions were sweeps, with Fox4 running the table at 6 a.m. and WFAA8 doing likewise at 5 and 6 p.m. 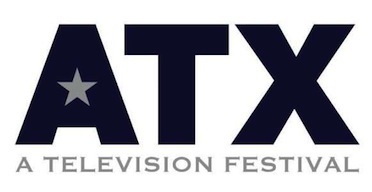 The inaugural ATX Television Festival is ramping up for June 1-3 in Austin. For starters, co-founders Caitlin McFarland and Emily Gipson have assembled a nice list of guests and screenings in hopes of "creating an opportunity to take the water cooler conversation public." Information on how to buy a badge is here. And you can go here on the official ATX site for a look at the confirmed participants. Any self-respecting Austin TV festival of course has to have a contingent of Friday Night Lights stars and producers. So this will be the big Saturday night event, with outdoor screenings of the NBC series' first and last episodes plus scheduled appearances by executive producers Jason Katims and David Hudgins, music supervisor Liza Richardson and cast members Jesse Plemons, Matt Lauria, Alicia Witt, Scott Porter, Gaius Charles, Dora Madison Burge, Brad Leland, Louanne Stephens and Michael B. Jordan. Other TV shows with panels and screenings attached include FX's Archer, NBC's Grimm and Parenthood, HBO's True Blood, The CW's The Vampire Diaries, MTV's Teen Wolf and USA's Royal Pains and Suits. Again, check out the festival's website to see if this might be worth your time and money. Every festival has to start somewhere, and we can't vouch for how well this one will be run. But it does sound like a good idea, and I hope it works out well for everyone. The hype had barely dried on the finales of American Idol and Dancing with the Stars before their respective networks threw themselves into two more talent competition shows. ABC's new Duets and the latest edition of Fox's So You Think You Can Dance aired opposite each other from 7 to 9 p.m. Thursday. Duets, with inaugural Idol Kelly Clarkson as one of the mentors/singers, nipped Dance in total D-FW viewers by a score of 169,353 to 162,578. But Dance in turn edged Duets among advertiser-prized 18-to-49-year-olds -- 83,260 to 73,653. Both shows were beaten in total viewers by CBS' repeats of The Big Bang Theory (from 7 to 7:30 p.m.) and Person of Interest (from 8 to 9 p.m.). Thursday's 9 p.m. hour was won by Fox4's local newscast in both ratings measurements. Its victims included the new season premiere of ABC's Rookie Blue and the series finale of NBC's Awake. In local news derby results -- the first since Wednesday's end of the May "sweeps" -- CBS11 took the 10 p.m. gold in total viewers while Fox4 ran first with 25-to-54-year-olds, the main advertiser target audience for news programming. NBC5 swept the 6 a.m. competitions and Fox4 did likewise at 5 p.m. Fox4 and CBS11 tied for the total viewers lead at 6 p.m., with Fox4 prevailing among 25-to-54-year-olds. LOCAL NEWS NOTE: Friday, May 25th marked Lisa Pineiro's last day as co-anchor of CBS11's weekday early morning newscasts, the station says. Her replacement, Adrienne Bankert, is scheduled to start on June 25th. In the interim, incumbent co-anchor Keith Garvin will solo anchor, CBS11 says. In the early morning Nielsens for the May sweeps, CBS finished a distant fourth in both total viewers and 25-to-54-year-olds. Jane Slater and Chris Arnold will be audiophiles at 105.3 THE FAN. Jane Slater has put a stop to her part-time early evening traffic reporting on WFAA8 and is joining 105.3 FM radio (THE FAN) as a midday sports talk host. Her partner, from 10 a.m. to 2 p.m. weekdays on Elf and Slater, will be radio veteran Mark Elfenbein. Slater replaces former Texas Rangers play-by-play man Josh Lewin, who left earlier this year to become the voice of the New York Mets. Slater, formerly a freelance news reporter at CBS11, migrated to WFAA8 in April of last year to do traffic briefs on the station's 5 and 6 p.m. weekday newscasts. She also continued to work at Dallas-based KRLD-AM radio (1080) as a morning drive reporter. Both radio stations are owned and operated by CBS radio. Slater has a sports background as a sideline reporter for the Southland Conference Television Network. Raised in Rowlett and a graduate of the University of Texas at Austin, she also covered sports during previous tenures at TV stations in Tyler, TX and Denver. CBS Radio also announced Thursday that Chris Arnold, longtime arena host for Dallas Mavericks home games, will be joining THE FAN on The G-Bag Nation show, which airs from 7 p.m. to midnight. His partner will be incumbent Gavin Dawson. "Their characteristics, personalities and unique perspectives emphasize our goal to be the voice of the man diverse sports fans across North Texas," CBS Radio vice president of news/talk/sports programming said in a publicity release. Both of the new shows are scheduled to start on June 4th. After a winless May last year, NBC5 logged two No. 1 local news finishes this time out, including a dethroning of Fox4 as the most-watched early morning newscast and a worst-to-first upgrade at 5 p.m.. But Fox4 topped three of the four major battlegrounds in the 25-to-54-year-old demographic, the main advertiser target audience for news programming. In the showcase 10 p.m. competition, CBS11 defended its February "sweeps" championship in total viewers while WFAA8 won among 25-to-54-year-olds and added a 6 p.m. gold in Nielsen's total viewers measurement. Here are the May 2012 ratings "sweeps" results for the four-way competitions at 10 p.m. and at 6 a.m., 5 p.m. and 6 p.m. Figures in parentheses represent audience plusses or minuses from May 2011. Because of very close races in several time periods, numbers again have been extended to four decimals (1.417 for instance) to determine winners. Comments: The across-the-board drop-offs will re-activate alarms at all four stations. Ratings point erosion accounts for some of that, but growing numbers of viewers clearly are finding other 10 p.m. alternatives. CBS11 again had a total viewers lead-in advantage from the 9:45 to 10 p.m. portion of network programming. But WFAA8 likewise inherited a significant edge from ABC in the 25-to-54 demographic. It also should be noted that WFAA8 "won" in both of these measurements in May 2011 by "throwing out" its final night's newscast and re-titling it a tornado special. Had WFAA8 not opted to take a knee and protect its lead, CBS11 would have been a paper-thin No. 1 a year ago in both total viewers and 25-to-54-year-olds. Comments: WFAA8 couldn't quite get over the hump in either measurement, but clearly is the station with the early morning momentum. A saturation comedy campaign on behalf of co-anchor Ron Corning has paid big tune-in dividends, but viewers then have to like him enough to stay tuned. NBC5 took the overall 6 a.m. crown despite a patchwork lineup that still isn't entirely settled. That's quite an accomplishment. Fox4 sustained serious year-to-year audience losses that will have to be addressed immediately. And CBS11 can't go much lower. A year ago, it trailed third-place WFAA8 by just 8,519 total viewers. Now that gap is 54,599 viewers. It's a complete disaster for a station that for a time appeared to be gaining some traction in the early morning but has skidded back into a quarry. The 5 to 6 a.m. portions of these newscasts had the same respective winners -- NBC5 and Fox4. WFAA8's Daybreak then bounced considerably higher than its competitors in the 6 to 7 a.m. hour. Comments: CBS11 had been running strong at 6 p.m. in total viewers, but dropped off the map in this latest sweeps. And its 25-to-54 drawing power is now sub-abysmal. NBC5 was the only station to show even a minimal year-to-year audience gain among the four stations. The two winners, WFAA8 and Fox4, both hemorrhaged viewers from year-to-year. It leaves the Peacock as the only station in halfway decent shape at this hour. But it can't crow. It can only peep. Comments: NBC5, which trailed first-place WFAA8 by 28,603 total viewers in May 2011, made its own lead-in bed with a 4 p.m. local newscast that nearly tied Fox4's syndicated Judge Judy for first place. WFAA8, on the other hand, declined to launch a local newscast in place of The Oprah Winfrey Show. Its replacement part, Dr. Oz, ran a distant third behind Fox4 and NBC5. NBC5 is the only station with even a hint of momentum in this news slot. CBS11 is at the opposite end of that teeter-totter, with a stunning loss of 60,460 total viewers from May to May. ***Fox4's 9 p.m. local newscast demolished CW33's one-hour alternative by a score of 176,127 to 13,548 in total viewers and 81,251 to 6,019 in the 25-to-54 demographic. ***In a role reversal, the 7 to 9 a.m. portion of Fox4's Good Day was beaten by both NBC's Today and ABC's Good Morning America in total viewers. Fox4 moved up a notch to second place, behind front-running GMA, among 25-to-54-year-olds. ***The CBS Evening News, anchored by former WFAA8/NBC5 reporter Scott Pelley, ran fourth in both total viewers and 25-to-54-year-olds. ABC's World News nipped NBC's Nightly News for first place in total viewers, with Fox4's local half-hour in third place. Among 25-to-54-year-olds, Fox4 pulled into second place behind the league-leading World News. The May "sweeps" ratings period ended on a traditional note Wednesday, with Fox's American Idol finale trouncing all comers. A fifth straight white dude, Phillip Phillips, wound up winning while 521,606 D-FW viewers hung in there. Idol's Nielsen numbers are significantly down in this its 11th season. Still, any rival network would kill for those diminished returns. Fox4's 9 p.m. local newscast rode Idol's coattails to a convincing win and one of its largest hauls in recent memory -- 359,027 viewers. Idol and the news also were runaway firsts among advertiser-prized 18-to-49-year-olds. In local news derby results, the closing night of the sweeps put NBC5 in the 10 p.m. driver's seat among total viewers while Fox4 was tops with 25-to-54-year-olds, the main advertiser target audience for news programming. The 6 a.m. golds were split between the Peacock in total viewers and WFAA8 in the 25-to-54 demographic. WFAA8 swept the 6 p.m. proceedings and also won at 5 p.m. with 25-to-54-year-olds. The 5 p.m. total viewer spoils were shared by NBC5 and WFAA8. For a complete report on the May "sweeps" local newscast finals, go here. ABC's Dancing with the Stars spring season finale drew Tuesday's biggest crowd while Fox had the demographic darlings. The Green Bay Packers' Donald Driver added a Mirror Ball trophy to his Super Bowl ring to the joy and merriment of Uncle Barky and 406,446 D-FW viewers, including 433,542 for the climactic 15 minutes. That allowed DWTS to dominate the 8 to 10 p.m. slot after Fox's next-to-last American Idol installment for the season won the 7 p.m. hour with 392,898 viewers. Fox also called the 7 to 9 p.m. tune among advertiser-prized 18-to-49-year-olds, with Idol romping before the Glee season finale edged the first hour of DTWS, which easily won from 9 to 10 p.m. in this key measurement. CBS offered a three-pronged festival of NCIS reruns, but the first two were still potent enough to beat NBC's America's Got Talent in total viewers. NCIS ran a distant fourth all night, though, with 18-to-49-year-olds. Over on Fox Sports Southwest, the Texas Rangers' late-starting 3-1 win at Seattle averaged 203,223 total viewers. In Tuesday's local news derby results, WFAA8 again cut away from the DWTS finale faster than sports anchor Dale Hansen can say "No Thank You" to a veggie plate. The station won decisively at 10 p.m. in total viewers, but the overall haul of 270,964 ended up being a sharp drop-off from the 433,542 who watched the 9:45 to 10 p.m. portion of DWTS. WFAA8 also ran first by a comfy margin among 25-to-54-year-olds, the main advertiser target audience for news programming. Fox4 likewise ran the table at 6 a.m. while adding 5 and 6 p.m. golds in the 25-to-54 demographic. WFAA8 won at 5 p.m. in total viewers and CBS11 had the most viewers at 6 p.m. Given a helping hand by CBS repeats and a shortened Dancing with the Stars, Fox's final episode of House at last won its time slot Monday night. The 8 p.m. farewell, preceded by a nicely done retrospective, drew 250,642 D-FW viewers while also setting the pace among advertiser-prized 18-to-49-year-olds with 121,687 of 'em. ABC's first hour of The Bachelorette ran second from 8 to 9 p.m. in both measurements (169,353 total viewers and 73,653 in the 18-to-49 range). ABC's penultimate Dancing episode of the spring season had the night's biggest overall audience with 372,576 total viewers. It likewise won the 7 p.m. hour among 18-to-49-year-olds, with the House warming second across the board. NBC's America's Got Talent managed only a pair of bronzes in its third Howard Stern-fueled outing of Season 7. Fox4's 9 p.m. local newscast swept that hour. The two-hour debut of NBC's American Ninja competition ran fourth in total viewers but moved up to third in the 18-to-49 demographic, beating CBS' combo of sitcom reruns and Clash of the Commercials: U.S. vs. the World. Which was interrupted by commercials. In local news derby results, CBS11 notched a big win at 10 p.m. in total viewers to maintain its slim lead over WFAA8 with just two nights to go in the May "sweeps" ratings period. Fox4 was a runaway first, however, among 25-to-54-year-olds, the main advertiser target audience for news programming. NBC5 rebounded with twin wins at 6 a.m. to stay in the thick of that three-way race among the Peacock, Fox4 and WFAA8. Fox4 ran the table at 5 p.m. and added a 6 p.m. win in the 25-to-54 demographic. NBC5 topped the 6 p.m. competition in total viewers. D-FW's CBS11 has named Adrienne Bankert to be its new early morning co-anchor, with her first day set for June 25th. She replaces Lisa Pineiro, whose contract was not renewed as previously reported on unclebarky.com. Bankert arrives from NBC affiliate KCRA and sister station KQCA in Sacramento, where she's been part of the morning news team since 2004 while also hosting the monthly news magazine Common Ground. "Adrienne is intelligent and engaging," CBS11/TXA21 president and general manager Gary Schneider said in a statement Monday. "I think our viewers will enjoy her personality and appreciate her genuine interest in the community." 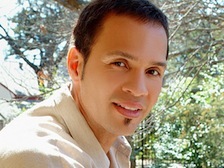 A University of Southern California grad, Bankert also has freelanced in Los Angeles for PBS, ABC, Spike TV and BET. "I've visited friends in Texas many times, and I've always loved it," she says. "It already feels like home." Bankert will join holdover Keith Garvin on the 4:30 to 7 a.m. shift. The station remains a distant fourth in the early morning ratings while competing with the waker-uppers on Fox4, NBC5 and WFAA8. Coincidentally, CBS11's news director also is named Adrienne -- Adrienne Roark. It will mark the second time in the D-FW market that a station's weekday early morning anchors are both African-American. 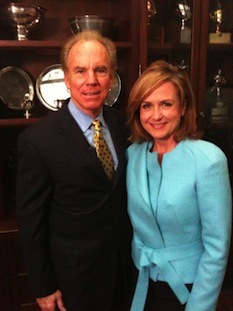 Michael Scott and Shelli Lockhart teamed briefly at NBC5, starting in 2000. She left the station in 2001 after six years and he was at NBC5 from 1999 to 2003. Here's what their promo looked like, circa 2000. Only Tom Selleck's latest Jesse Stone movie stood in the way of the Texas Rangers-Houston Astros being top draws for all three games of their weekend series. CBS' eighth film in the series, Jesse Stone: Benefit of the Doubt, drew 291,286 D-FW viewers Sunday to rank as that day's most popular TV attraction. CBS11's 10 p.m. newscast, coasting on Stone's coattails, ranked No. 2 with 257,416 viewers while Fox Sports Southwest's Sunday afternoon telecast of the Rangers' win over the Astros finished third overall with 223,545 viewers. Stone also outdrew two fairly formidable competing attractions on rival networks. NBC's season finale of The Celebrity Apprentice (won by Arsenio Hall) had 182,901 viewers while ABC's Billboard Music Awards drew 176,127. Otherwise a dark demographic cloud hung over Jesse Stone, as it does with many popular CBS entries. Only 28,821 of the movie's viewers were in the advertiser-prized 18-to-49 demographic. That landed it in fourth place among the Big Four broadcast networks, with Celebrity Apprentice registering a league-leading 92,867 viewers in this key demographic. Also on Sunday, the final round of the Byron Nelson golf tournament averaged just 54,193 viewers on CBS, with only 12,809 of them in the 18-to-49 age range. ABC's competing Miami Heat-Indiana Pacers playoff game had 135,482 viewers, including 60,844 of the 18-to-49 persuasion. Saturday's Rangers' loss to Houston, most of it in prime-time on the Fox broadcasting network, easily led all of that day's offerings with 291,286 total viewers. NBC's early evening telecast of The Preakness had 182,901 viewers for the 15-minute increment in which the race was actually run. Round 3 of the Byron Nelson hooked into the deep rough with just 40,645 viewers. The season finale of NBC's Saturday Night Live, with Mike Jagger as both host and musical guest, had 169,353 total viewers. It also marked the goodbye for regular cast member Kristen Wiig, who was serenaded with "Ruby Tuesday." Rangers-Astros likewise led all Friday programming with 230,319 viewers on TXA21. The next closest prime-time attraction, ABC's 9 p.m. edition of 20/20, had 149,030 viewers. The Rangers, who won Friday's game, also were the day's top draw with 18-to-49-year-olds. In Friday's local new derby results, WFAA8 swept the 10 p.m. competitions in both total viewers and 25-to-54-year-olds, the main advertiser target audience for news programming. Fox4 did likewise at 6 a.m. while the early evening races were split. At 6 p.m., WFAA8 won in total viewers and Fox4 with 25-to-54-year-olds. At 5 p.m., NBC5 topped the total viewer Nielsens while WFAA8 had the edge with 25-to-54-year-olds. Just three weekdays remain in the May "sweeps" ratings period, with most competitions still undecided. But WFAA8 looks to have a lock on the 6 p.m. race in total viewers and at 10 p.m. in the 25-to-54 demographic. CBS11, which won both of those face-offs in May, has a chance to win only at 10 p.m. in total viewers. But the station could be caught at the tape by WFAA8, whose ABC network is providing more potent first-run lead-in programming. That includes Tuesday's Dancing with the Stars season finale while CBS bails out early with a 9 p.m. menu of Clash of the Commercials on Monday and crime series repeats on Tuesday and Wednesday. This season's penultimate performance edition of Fox's American Idol set Thursday's prime-time pace before a new episode of the network's Touch offered a case study in Death Valley syndrome. Idol, with finalists Phillip Phillips and Jessica Sanchez emerging for next Tuesday's sing-off, drew 447,091 D-FW viewers to easily win the 7 to 8 p.m. slot while also topping all of the night's prime-time attractions. But Touch, which moves to Fridays next fall, then super-dipped to 128,708 viewers while losing audience in each quarter hour. CBS' Season 1 Person of Interest finale won the hour with 311,609 viewers before the network's season-ending episode of The Mentalist rolled at 9 p.m. with 291,286 viewers. Among advertiser-prized 18-to-49-year-olds, Idol held serve in its time slot, as did The Mentalist. But ABC's season finale of Grey's Anatomy ruled at 8 p.m. by a wide margin over NBC's runner-up double dip of Community. In local news derby results, CBS11 lengthened its lead over WFAA8 in total viewers with another 10 p.m. win while holding on this time with a No. 1 finish among 25-to-54-year-olds, the main advertiser target audience for news programming. With four weeknights to go, CBS11 looks as though it will have just enough juice to prevail at 10 p.m. in the May "sweeps" total viewers race. But its network won't be of much help with 9 p.m. lead-ins next week, offering crime drama repeats on Tuesday and Wednesday while WFAA8's late night newscasts inherit lead-ins from the Dancing with the Stars season finale and the Season 1 ender of Revenge. Could you fry eggs on the steaming heads of local CBS station managers around the country? Quite possibly. But they can't say anything publicly in D-FW, because CBS11 is owned-and-operated by the network. In the still air tight 6 a.m. derby, NBC5 logged a win in total viewers while Fox4 took the 25-to-54 gold. Those stations and WFAA8 again were closely bunched together in both competitions. Any one of the three could still be winners after the sweeps end Wednesday. Fox4 ran first at 5 and 6 p.m. with 25-to-54-year-olds. The total viewer wins went to NBC5 at 5 p.m. and WFAA8 at 6 p.m. Nearing the Season 11 finish line, Fox's American Idol percolated in Wednesday night's D-FW Nielsens with 447,091 viewers from 7 to 9 p.m.
That easily led all programming, with CBS' two-hour Criminal Minds season finale placing second overall with 318,383 viewers while the Texas Rangers' Yu Darvish-powered win over Oakland averaged 250,642 viewers. Idol and Fox4's following 9 p.m. local newscast swept their time periods among advertiser-prized 18-to-49-year-olds. ABC's Revenge has been renewed for a second season, but continues to struggle at 9 p.m. in D-FW. Wednesday's new episode ran fifth in that slot in both ratings measurements. In local news derby results, CBS11 again edged WFAA8 at 10 p.m. in total viewers, but Fox4 ran a solid first among 25-to-54-year-olds, the main advertiser target audience for news programming. Fox4 also scored two close wins at 6 a.m. in what remains a tight three-way battle with both NBC5 and WFAA8. WFAA8 ran the table at 6 p.m., took the 5 p.m. competition among 25-to-54-year-olds and tied for first place with the Peacock in total viewers. NBC's second two-hour helping of a Howard Stern-fueled America's Got Talent ran out of gas Tuesday night. AGT drew 209,998 D-FW viewers from 7 to 9 p.m., down from the 277,738 who watched Stern's limp nice guy Monday night debut. And among advertiser-prized 18-to-49-year-olds, AGT's night to night haul dropped from 140,901 to 96,069. The 7 to 8 p.m. hour was won in total viewers by CBS' NCIS, which had 379,350 to easily outpoint Fox's runner-up episode of Glee (223,545 viewers). ABC's Dancing with the Stars results show topped the 8 to 9 p.m. hour with 345,479 viewers, beating CBS' first hour of NCIS: Los Angeles (284,512 viewers). In the 18-to-49 Nielsens, Fox's first hour of Glee ran first from 7 to 8 p.m. before Dancing and AGT tied for the top spot in the 8 p.m. hour. Glee ran a very close third and NCIS: Los Angeles burrowed into fourth place for both hours. The 9 p.m. spoils went to hour two of NCIS: Los Angeles in total viewers and the Season 1 finale of NBC's Fashion Star in the 18-to-49 demographic. Over on Fox Sports Southwest, the Texas Rangers' second straight loss to unheralded Kansas City slumped to an overall game average of 176,127 total viewers. Now to the local news derby results, with just six weeknights left to be counted in the 20-day May "sweeps," which end on Wednesday of next week. CBS11 edged WFAA8 for the top spot in total viewers at 10 p.m., but fell to fourth among 25-to-54-year-olds (main advertiser target audience for news programming). WFAA8 won that skirmish and is pretty comfortably ahead at the 14-day mark in the 25-to-54 race. Defending February sweeps champ Fox4 regrouped in the topsy turvy 6 a.m. competition, running the table while Monday's doubleheader winner, WFAA8, slipped to second place in both measurements. NBC5 weighed in with two firsts in the 6 p.m. Nielsens and added a 5 p.m. win in total viewers. Fox4 won the earlier hour among 25-to-54-year-olds. On his best behavior -- which pretty much made him a bore -- a soft-serve version of Howard Stern swaggered onto the Season 7 premiere of NBC's America's Got Talent Monday night. His ballyhooed arrival wasn't enough to outdraw ABC's competing Dancing with the Stars in total D-FW viewers. But AGT did prevail among advertiser-prized 18-to-49-year-olds. Dancing had Monday's overall biggest audience haul, with 399,672 viewers from 7 to 8:30 p.m. The Texas Rangers' 3-1 home loss to Kansas City on Fox Sports Southwest came up big nonetheless with an average of 298,060 viewers. AGT pulled in 277,738 viewers from 7 to 9 p.m. to rank third for the night. In the 18-to-49 festivities, AGT led all programming with 140,901 viewers in this age range. CBS' one-hour How I Met Your Mother season finale placed second with 121,687 viewers, ahead of Dancing's 112,081. The entire Rangers-Royals game averaged 102,474 viewers in this key demographic, running just a bit behind CBS' comedy duo of Two and a Half Men (108,878) and Mike & Molly (105,676). FSS is still counting its money, though, because those are very strong numbers for the first-place Rangers against a non-marquee team. ABC's latest season debut of The Bachelorette drew 176,127 total viewers from 8:30 to 10 p.m., beating only NBC's Season 1 finale of Smash in that measurement. But Bachelorette ran first from 9 to 10 p.m. among 18-to-49-year-olds opposite the competition from Fox, CBS and NBC. PBS' two-hour American Masters presentation, "Johnny Carson: King of Late Night," drew 88,063 total viewers with only 9,607 in the 18-to-49 demographic. It aired from 8 to 10 p.m. locally on KERA13. In Monday's local news derby results, WFAA8 enjoyed a very big day with sweeps at 10 p.m. and 6 a.m. and 6 p.m. in total viewers and 25-to-54-year-olds, the main advertiser target audience for news programming. WFAA8 also won at 5 p.m. in total viewers. But Fox4 staved off an exceedingly rare double grand slam by placing first with 25-to-54-year-olds. Three sold-out Rangers-Angels games also outdrew everything else over the weekend during successive appearances on TXA21, the Fox network and ESPN. Friday's rain-soaked opener, featuring a matchup of Yu Darvish and former Ranger C.J. Wilson, provided a mega late night bonus for TXA21. Audiences peaked between 10:15 and 10:45 p.m., when 480,361 D-FW viewers were on hand to watch Texas eventually win 10-3. A lengthy rain delay otherwise threw a wet blanket over most of the prime-time portion, with TXA21 resorting to some sort of canned country music jamboree while biding time. Friday's next biggest attraction, CBS' 9 p.m. episode of Blue Bloods, had 277,738 viewers. The nationally televised Saturday afternoon game on Fox, won 4-2 by the Angels, averaged a very nice-sized 325,157 D-FW viewers. In comparison, Fox's latest prime-time NASCAR race drew just 108,386 viewers. Sunday night's closer, in which the Rangers punched out the Angels 13-6, averaged 359,027 viewers on ESPN. The next biggest draw, ABC's limp two-hour series finale of Desperate Housewives (has a series ever been more played out?) drew 250,642 viewers from 8 to 10 p.m. In Friday's local news derby numbers, CBS11 edged WFAA8 in total viewers at 10 p.m., but dropped to fourth with 25-to-54-year-olds (main advertiser target audience for news programming) while WFAA8 took the gold by a comparatively comfy margin. Firsts also were split at 6 a.m., with NBC5 topping the field in total viewers and Fox4 winning in the 25-to-54 demographic. WFAA8 ran the table at 6 p.m. and shared the 5 p.m. lead among 25-to-54-year-olds with Fox4. NBC5 won at 5 p.m. in total viewers. 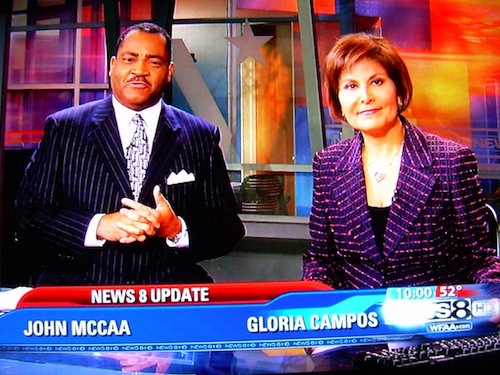 Veteran anchor Gloria Campos is officially on board with a new contract and a transition that will take her off WFAA8's 6 p.m. newscasts in September. But she'll continue co-anchoring the Dallas-based station's 10 p.m. newscasts with John McCaa. They've been a duo at that hour since August of 2002 after earlier being part of a tri-anchor system with Scott Sams that started in spring 1999. Campos confirmed over the weekend that she'll sign a new deal Monday calling for reduced hours, a pay cut and an extension at WFAA8 until the end of February 2014. She'll also be "filling in where needed and doing occasional specials," Campos said. WFAA8 hired Campos in 1984 as its first Hispanic anchor. WFAA8's new 6 p.m. co-anchor presumably will be staffer Shelly Slater, who currently is the station's 5 p.m. co-anchor with McCaa. But WFAA8 hasn't made any announcement yet. Earlier this year, Slater was wooed by Oklahoma City's KOCO-TV and interviewed at the station after management invited her in. But KOCO's incumbent 6 and 10 p.m. co-anchor, Jessica Schambach, eventually decided to stay in place after visiting D-FW to interview for CBS11's early morning co-anchor position. The station is not renewing the contract of Lisa Pineiro, who remains on the 4:30 to 7 a.m. shift but has been told she's free to pursue other opportunities. Her contract with CBS11 expires in October. Slater has not returned emails asking about her intentions or any promotion. Longtime WFAA8 sports anchor Dale Hansen signed a contract extension with WFAA8 in January, taking a 32 percent pay cut in the process, he said. McCaa has told unclebarky.com that he also anticipates a salary adjustment when his contract is up for renegotiation later this year. WFAA8 had a tough time in the February "sweeps" ratings period, failing to win at 6 a.m. or 5, 6 and 10 p.m. in either total viewers or 25-to-54-year-olds, the main advertiser target audience for news programming. But the station is in the midst of a rebound during the ongoing May sweeps, where it likely will finish first in at least two time slots -- 6 p.m. in total viewers and 10 p.m. in the 25-to-54 demographic. WFAA8 also is in the thick of other races, including a very close three-way early morning battle in both ratings measurements. After hanging on precariously with a weekly series of Bottom 2 cliffhangers, McKinney's Hollie Cavanagh finally fell off Fox's American Idol Thursday night. It means she won't get the so-called "Hero's Homecoming" reserved for the show's three finalists. But Cavanagh did survive all the way to the Final Four before 440,317 D-FW viewers watched her "journey" end in Idol's closing 15-minute segment. Overall, Idol averaged 392,898 viewers, making it Thursday's most-watched attraction ahead of CBS' runner-up 8 p.m. episode of Person of Interest (345,479 viewers). But among advertiser-prized 18-to-49-year-olds, Idol again was outdrawn in its first half-hour by CBS' competing The Big Bang Theory. ABC's Grey's Anatomy and Fox4's local newscast were tops from 8 to 10 p.m. with 18-to-49-year-olds while CBS' The Mentalist edged Fox4's news for the most total viewers in the 9 p.m. hour. Among the Big Four broadcast networks, NBC's prime-time lineup of four comedies and Awake ran fourth across the board in total viewers. The Peacock's most popular show among 18-to-49-year-olds, The Office, managed a second place finish at 8 p.m. Fox's Touch lost the lion's share of its Idol lead-in to finish fourth from 8 to 9 p.m. in both ratings measurements. On Fox Sports Southwest, the Texas Rangers drew 128,708 total viewers for their afternoon loss at Baltimore and 223,545 for their nighttime win. Here are Thursday's local news derby results: CBS11 edged WFAA8 at 10 p.m. in total viewers, but Fox4 took the top spot with 25-to-54-year-olds, the main advertiser target audience for news programming. In the see-saw early morning race, Fox4 rebounded with 6 a.m. wins on both scorecards. 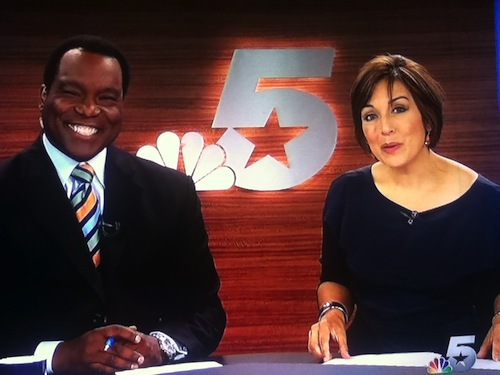 WFAA8 ran first at 5 and 6 p.m. among 25-to-54-year-olds while sharing the 5 p.m. total viewers gold with NBC5. The Peacock nipped WFAA8 for the top spot in total viewers at 6 p.m.
Dallas doing Dallas again --- for red carpet premiere. Newly announced Thursday, the above is pretty self-explanatory. 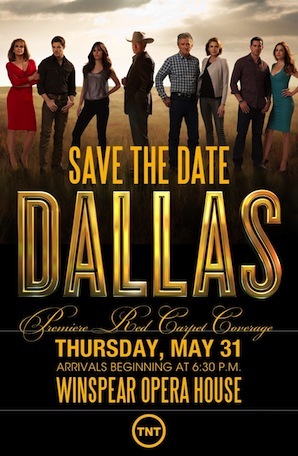 TNT's new version of Dallas will hit home screens on June 13th for the first of 10 episodes. But first comes some gala red carpet action in downtown Big D.
Former KXAS-TV anchor Dave Layman, illustrated with glass in hand for a 1981 Scene Magazine cover story and in current photo. Dave Layman got dropped as an anchor at KXAS-TV (now better known as NBC5) in the same year that Jane McGarry arrived at the Fort Worth-based station. Those were the long-ago days when both news directors and on-air personnel talked candidly about what led to a parting of the ways. 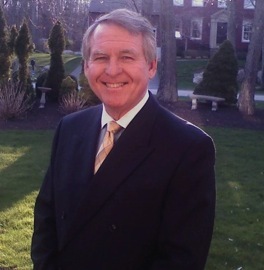 In Layman's case, he considered himself a reporter first and an anchor second. And after just 20 months of anchoring KXAS's 5, 6 and 10 p.m. newscasts with Jane Jayroe, that proved to be an unwieldy mix in the view of station management. The details are in this previously published May 20, 1982 article by your friendly content provider. But there's now a new chapter. Layman emailed me Thursday to express his feelings about McGarry's DWI arrest early Sunday morning and how he and many other high-wire news anchors for years have tempted the same fate. He initially wanted it to be private, but reconsidered upon request. "You can use whatever you want and you can use my name," Layman agreed. "I have fought for transparency in media and government all these years, so I should insist on it for myself as well." Here, in his own words, is what Layman has to say. It's highly recommended reading. I feel awful for Jane McGarry. News anchor or not, she is a human being. I am sure in her three decades she has endeared herself to the DFW audience and has devoted a lot of her free time and energy to causes that have benefited many people. That shouldn't be overlooked. That is also not a waiver of responsibility. She apparently made a mistake and is paying for it dearly, regardless of the outcome. It's also fair to say that she is a legitimate news story because she is a public figure by choice. When I was anchoring in Dallas, I, too, was a drinker -- a moderate one. At the time, Texas law allowed drivers to drink and drive. I still can't believe that. When I returned to Providence as an anchor and occasional news director/anchor, I continued the practice from time to time on weekends -- having a drink at home with my girlfriend at the time and then headed to Newport (30 minutes away) drinking a "traveler" in the car on the way. In Rhode Island, however, there was no such allowance for drinking while driving. At one point, I thought, "How dangerous is this!" While I never did this under the influence, I thought I am risking my career and reputation by drinking and driving in a state that does not permit it. More importantly, I was risking injuries to myself and others. So I quit. December 17, 1987 was the last day I had an alcoholic drink. Period. And that's my point in writing this. I am now a marketing/media/PR consultant. If I had a high profile client -- and he/she asked for some counsel along this line -- I would tell them if they wanted to avoid a host of problems, including a DUI/DWI threat, quit drinking. Period. It's not worth it, even if you don't have a "drinking problem." News anchors are in high stress/high adrenalin positions. In many ways, these jobs are very different from others -- almost unique. Every day they perform. Every day there is a critique. Every day there is disappointment or exhilaration. At the end of your shift, you are generally on a "high." If you do the early or late news, the high ends abruptly and you go home or go out to a local bar. Often, there is an attempt to continue the high. Alcohol is a wonderful partner, even if it is just two or three drinks. Alcohol affirms and continues the great mood after a particularly good newscast. Alcohol glosses over and helps you minimize those days when things went poorly or the ratings came in. It's also a way of having a good time at a bar afterwards, "where everyone knows your name and face." That's why my advice to high profile people is to end the drinking. It doesn't stop you from doing stupid things, but it reduces the likelihood -- and the risk of hurting others, yourself and your reputation. As I look back on my four decades in broadcasting (I still do a weekly news/public affairs/analysis program on the Rhode Island PBS station), quitting drinking was the best career decision I ever made. Just some thoughts as I see Jane join the daily list of news anchors around the country publicly humiliated and in deep personal and professional straits -- thanks to a liquid friend that is more liquid than friend. Absent any competition from the rained-out Texas Rangers, Fox's American Idol dominated Wednesday's prime-time Nielsens before two crime shows split the proceeds at 9 p.m. The latest two-hour performance show, with McKinney's ever-endangered Hollie Cavanagh among the four finalists, averaged 392,898 D-FW viewers from 7 to 9 p.m.. ABC's Modern Family made the next best showing with 264,190 viewers at 8 p.m. Idol likewise swept those hours among advertiser-prized 18-to-49-year-olds. At 9 p.m., CBS' CSI: Crime Scene Investigation led the way in total viewers (223,545) but NBC's Law & Order: SVU had the most 18-to-49-year-olds. Here are Wednesday's local news derby results. CBS11 cruised at 10 p.m. in total viewers while sharing first place with Fox4 among 25-to-54-year-olds, the main advertiser target audience for news programming. In the air tight, three-way 6 a.m. race, WFAA8 broke through to nip NBC5 in total viewers while winning by a bit more comfy margin in the 25-to-54 demographic. Fox4 took the 5 and 6 p.m. golds among 25-to-54-year-olds. The total viewer firsts went to WFAA8 at 6 p.m. and NBC5 at 5 p.m.
10 p.m. -- It's CBS11's lone bright spot so far, with the station holding a three-tenths of a point lead over WFAA8 in total viewers. Among 25-to-54-year-olds, WFAA8 is ahead by four-tenths of a point over both Fox4 and NBC5, with CBS11 a half-point behind the leader. 6 a.m. -- This is the most interesting battleground of the sweeps. So far NBC5 has a two-tenths of a point lead in total viewers over defending February sweeps champ Fox4 and onrushing WFAA8. It's even closer in the 25-to-54 demographic, where Fox4 is on top by one-tenth of a point over both NBC5 and WFAA8. 6 p.m. -- In total viewers, WFAA8 has a fairly comfortable half-a-ratings point lead over all three of its competitors. Fox4 is tops among 25-to-54-year-olds, but with WFAA8 just one-tenth of a point behind. NBC5 and CBS11 already are too far behind to catch up. 5 p.m. -- NBC5 and WFAA8 are tied for the lead in total viewers while Fox4 is three-tenths of a point behind both of them. Fox4 leads WFAA8 by one-tenth of a point in the 25-to-54-age range, with NBC5 four-tenths of a point behind the leader. Jane McGarry posing with Colin Powell and Roger Staubach. No. 1, NBC5 anchor Jane McGarry is not Public Enemy No. 1. Far from it. She most certainly is a public figure, though. 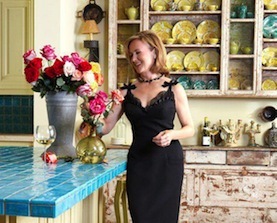 Those who contend she isn't -- and there are many -- perhaps should look at that little "Public Figure" tag on the "Jane McGarry NBC5 Fan Page." On that page and her other Facebook page, McGarry repeatedly asked/begged people to vote for her in D magazine's "Best of Big D Readers' Choice" poll until she went silent on May 6th. She's done the same on her Twitter page -- until recently, of course. As just about everyone must know by now, McGarry was arrested early on the morning of Sunday, May 6th on a DWI charge. She since has been taken off the air indefinitely while NBC5 "looks into the matter." Meanwhile, The Dallas Morning News cravenly and cynically has set up a "Who is your favorite Dallas-Fort Worth TV news anchor?" poll on its website. Her Facebook pals are rallying around it, with a guy named David Kelley writing, "All: Jane has overtaken the second-place newscaster and is now solidly in second place, herself. Only Meredith Land, Jane's worthy colleague, is ahead in the polling! Jane, these numbers are telling . . . you have support!" McGarry's Facebook pages lately are filled to the brim with adulation, prayers and biblical passages. Take it from Karen Beth Giles, who says, "Let those WITH OUT SIN CAST THE FIRST STONE!! Jane You should keep your job! You were on your time not NBC's." Hysterical. Other than perhaps Fox4 anchor Clarice Tinsley, nobody enjoys being perceived and portrayed as an around-the-clock TV star more than Jane McGarry. 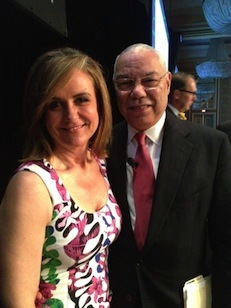 Her interviews with celebrities inevitably result in companion Facebook pictures of Jane and Colin Powell, Jane and Roger Staubach, Jane and Laura Bush, etc., etc. Before all of this happened, anyone who tried to tell McGarry she's not a public figure might well have received a stony glare in return. Like many a TV anchor, both local and national, the perks of fame have become addictive. And McGarry, via obvious cosmetic touch-ups and other "youthful" touches, now comes off as desperate to stay in front of a TelePrompTer after 30 years at the station. It's kind of sad. McGarry, who now has a police mug shot on her resume, has been roughed up a bit by some of the commenters on unclebarky.com. But for the most part, it's been a pretty above-board exchange that pales in comparison to the jokes and belittlement on other D-FW websites. McGarry, more than anyone, should know she's fair game. She works for an industry that lives off juicy scandals and oft-petty crimes. See Jane run with stories about other celebrities caught in the media bullseye. Before her own little embarrassment, she joined with other NBC5 anchors in trumpeting the latest tidbits in the Deion/Pilar Sanders "Divorce Drama," a dropped-from-heaven saga that landed right in the middle of the May "sweeps" ratings period. I've had limited one-on-one dealings with McGarry over the years. But all have been pleasant enough. And in happier times, she courted me via email to become one of her Facebook fans. The sometimes gleeful reaction to McGarry's predicament may in part be tied to the equally gleeful manner in which television stations hunt their various prey. As some commenters have noted, a prominent D-FW politician or athlete charged with driving while intoxicated would be splashed all over local newscasts. In that respect, McGarry has gotten off relatively easy. Fox4 hasn't reported anything on her arrest while WFAA8 and CBS11 made it a one-day story. NBC5 waited a full day to "confirm" McGarry's arrest before airing a brief corporate-approved story while at the same time saying that station management will have no further comment. It should be noted that NBC5 is one of the more forthcoming local stations when it comes to answering questions about their anchors, reporters or decision-making. CBS11 and CW33 also are usually prompt in replying, whether it's an official "no comment" or a basic confirmation of a hiring or departure. All Fox4 responses now are handled through the station's corporate offices in New York. But at least there's usually some sort of reply. As for WFAA8's upper management, well, let's just say that inquiries from unclebarky.com are about as welcome as a hitchhiker with pets, to quote an old Dan Rather-ism. McGarry's fate remains in the balance. But NBC5 has been phasing her out anyway, with the showcase 6 and 10 p.m. weekday newscasts in her past and the 5 p.m. newscasts her current reality along with those virtually invisible 6:30 p.m. "Nonstop Nightly" editions on the station's digital 5.2 channel. If she survives, fine. But an on-air statement of apology should go along with any return to the air. If she's cut loose, so be it. McGarry long has been far more a personality than a journalist. And while her Facebook fans may threaten reprisals, NBC5 won't miss a beat. In Tuesday's Nielsen ratings, the station's McGarry-less 5 p.m. newscast ran first in both total viewers and 25-to-54-year-olds, the main advertiser target audience for news programming. In the end, McGarry is paying the price of being a local celebrity and public figure. She should expect no less after trading on her fame and fortune for three decades. She had the misfortune to get caught. Now it's payback time. Josh Hamilton's historic four home run night -- plus a double -- in the Texas Rangers' 10-3 rout of Baltimore couldn't match the rival heavy hitters on broadcast networks Tuesday. Rangers-Orioles averaged 223,545 D-FW viewers on Fox Sports Southwest, the same as for Monday night's 14-3 smashing of Baltimore. The peak crowd of 264,190 viewers came during the closing 8:45 to 9 p.m. portion of Tuesday's game. CBS' 7 p.m. episode of NCIS had Tuesday's biggest haul of 419,994 viewers while NBC's following Season 2 finale of The Voice won the 8 to 10 p.m. slot with 388,672 viewers. CBS' NCIS: Los Angeles (311,609 viewers) and ABC's Dancing with the Stars results show (304,835 viewers) also outscored the Rangers. The Voice led the way among advertiser-prized 18-to-49-year-olds, with Fox's Season 1 finale of New Girl the night's second biggest draw in this key demographic. On Monday night, Dancing won its two-hour head-to-head battle with The Voice by a score of 379,350 total viewers to 325,157. But those positions again were reversed with 18-to-49-year-olds. ABC's Season 4 finale of Castle easily swept the 9 p.m. hour in both ratings measurements, weighing in with 318,383 total viewers. Here are the two days' local news derby results. Monday -- WFAA8 enjoyed a bountiful feast with sweeps of the 5, 6 and 10 p.m. competitions in both total viewers and 25-to-54-year-olds, the main advertiser target audience for news programming. Fox4 ran the table at 6 a.m., with WFAA8 finishing a fairly close third in both measurements. Tuesday -- The Peacock crowed loudest, with NBC5 sweeping the 6 a.m. and 5 p.m. slots and adding a 10 p.m. win among 25-to-54-year-olds. CBS11 topped the 10 p.m. field in total viewers while NBC5 and WFAA8 shared first place at 6 p.m. in that measurement, barely a mini-speck ahead of CBS11. Fox4's only win was a 6 p.m. gold in the 25-to-54 demographic. Bill Ratliff, who more than a generation ago co-hosted Dallas-based WFAA8's PM Magazine with Leeza Gibbons, died Tuesday afternoon of complications from surgery. He was 63. Ratliff left PM and WFAA8 in 1982 before starting a 27-year tenure as a news anchor at Tampa, Florida's WFLA-TV, an NBC affiliate. He resigned in April 2009 after the station told him he'd have to accept a substantial pay cut and fewer hours in order to continue at the station. "It's been a great ride, but the economy did me in," Ratliff said at the time. WFLA news director Don North expressed regrets, telling former Tampa Bay Tribune TV critic Walt Belcher that "we really wanted him to stay. But the news business is changing at an unprecedented pace, and in this tough economy we've had to make some difficult decisions." Gibbons went on to co-host Entertainment Tonight and her own syndicated talk show among other TV ventures. She also was a celebrity contestant in the Spring 2007 edition of Dancing with the Stars. Ratliff also anchored newscasts at WFAA8 but was primarily known for PM Magazine, a then breakthrough weekday program in which stations from around the country shared their feature stories while being fronted by local talent in each market. WFAA8 began carrying PM in 1978, airing it at 6:30 p.m. 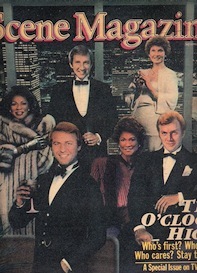 The concept endured from 1978 to 1991, although WFAA8 dropped the program well before its official demise. KDFW-TV (Channel 4) then briefly picked it up. Ratliff "was a great guy, and very unpretentious," said former WFAA8 reporter/anchor David Margulies,who left the station in 1986 to start The Margulies Communications Group. "He was very good at what he did, but he never acted like he was a big star. And quite frankly, on PM Magazine, he really was a big star." Ratliff's last position at WFAA8 was as a weekend anchor, with Margulies replacing him in that position after Ratliff left for Tampa in 1982 to eventually become a household name in that city. In the below 1980 WFAA8 sales presentation to advertisers, Ratliff and Gibbons can be seen together as PM hosts. The 7 minute, 28 second video is worth watching in its entirety for old school grins and memories. But the PM portion begins at the 2:23 mark, with Ratliff and Gibbons making their entrance at the 3 minute mark. NBC5 belatedly "confirmed" longtime anchor Jane McGarry's DWI arrest on its nbcdfw web site late Monday afternoon after the news and the official police report were publicized a day earlier on a variety of outlets. McGarry will "remain off the air as the company looks into the matter," the brief post said below a giant-sized picture of the veteran anchor. NBC5 also reported the arrest and its ramifications on the air for the first time Monday. On the station's 5 p.m. newscast, co-anchor Marc Fein basically read the text of the web account while 6 and 10 p.m. co-anchor Meredith Land sat in for McGarry. McGarry also anchors the 6:30 p.m. "Nonstop Nightly" on the station's digital 5.2 channel. 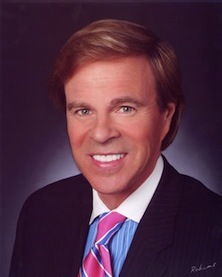 As posted earlier on unclebarky.com, McGarry joined KXAS-TV in 1982, long before it became NBC5 as one of NBC Universal's owned-and-operated stations. From April 1992 until July 2009, she teamed with former NBC5 newsman Mike Snyder on the station's weekday 10 p.m. newscast. McGarry so far has been silent on the arrest, and hung up her cell phone (figuratively) when reached Sunday night by unclebarky.com. But her Facebook Fan page has loaded up with comments in support of her, with a handful of naysayers lately weighing in. Comments also are piling up fast on NBC5's website, with Karen Dvorak contending that McGarry's arrest should not be considered news. "Why did 5 broadcast this?" she wrote. "This is not news and she has the right to privacy. More and more it seems to think it is Star magazine. Shame on you for putting this on your broadcast. She has a family and this is a personal family matter. If she violated her contract then take that up with her, don't put it on the air." The Dallas Morning News' "crime blog" first reported McGarry's arrest, with Belo-owned cousin WFAA8 quickly joining in both online and on the air Sunday. CBS11 had news of McGarry's arrest on its 10 p.m. Sunday newscast, but so far has not put anything on its website. Among D-FW's four major TV news providers, only Fox4 so far has not reported McGarry's arrest either on the air or on its website. Meanwhile, NBC5 led its Monday 4 and 5 p.m. newscasts with yet another extended chapter in the "Divorce Drama" between Deion and Pilar Sanders. Viewers got the brief news of McGarry's arrest at the 5:10 p.m. mark. Also on the 4 p.m. edition, NBC5's Amanda Guerra reported live from the scene of the two-part finale of NBC's The Voice, which will end its second season on Tuesday. Co-anchor Brian Curtis happily noted that he'll be joining Guerra in Hollywood on Tuesday. Glad they've got their priorities straight. You can't make this stuff up. The Dallas Mavericks' last playoff game of the season, a 4th quarter meltdown loss to the springy Oklahoma City Thunder, ended up being the least-watched as well. In fact, the Texas Rangers' extra winning win at Toronto came close to beating Mavs-OKC in virtually head-to-head competition Saturday night. And during the 15-minute Saturday segment in which the race was actually run, NBC's telecast of the Kentucky Derby had bigger audiences than both of them. Game 4 at least was a moral victory for TXA21's homegrown telecast, which for the first time decisively outdrew its cable counterpart in their post-season matchups. TXA21 averaged 149,030 D-FW viewers while TNT had just 67,741. The combined total of 216,771 fell dramatically below the 379,350 viewers for Games 1 and 2, and the 372,576 for Game 3. On Fox Sports Southwest, the Rangers' dramatic win against the Blue Jays averaged 196,449 viewers. Wow, that's only 20,322 fewer than the Mavs had for their do-or-die game against the Thunder. And the Derby had 325,157 viewers between 5:30 and 5:45 p.m. Saturday. In the end, Dallas blew a 13-point lead at the start of the fourth quarter, with their old tree trunk legs turning to rubber while OKC's saplings blew right by them to complete a 4-0 sweep of the defending champs. Friday night's Rangers-Blue Jays game on TXA21 averaged 230,319 viewers while FSS's Sunday afternoon finale of their three-game series drew 169,353 viewers. With the Rangers slumping of late, even another start by Yu Darvish couldn't quite do the trick Sunday, even though Texas-Toronto still outdrew all competing afternoon programming. In Friday's local news derby results, CBS11 swept the 10 p.m. competitions in both total viewers and 25-to-54-year-olds, the main advertiser target audience for news programming. Fox4 and WFAA8 tied for the total viewers lead at 6 a.m. while Fox4 nipped WFAA8 for first place among 25-to-54-year-olds. WFAA8 took the 6 p.m. gold in total viewers, but Friday's other news wins went to Fox4, which ran the table at 5 p.m. and added a 6 p.m. topper in the 25-to-54 demographic. Locked in a tight early morning May "sweeps" ratings race with Fox4 and WFAA8, Fort Worth-based NBC5 unveiled the newest member of its dawn patrol Monday. Mark Hayes, a 10-year veteran of the waker-upper wars at WAGA-TV in Atlanta, had no problem being personable. He laughed early and often, both at his own remarks and those of others. "I am so happy to be here," Hayes told seemingly entrenched incumbent Deborah Ferguson, who recently signed a new contract with NBC5. "And so happy to be in the land of brisket and football and all the things that I love." NBC5, which twice had declined to disclose a start-up date for Hayes, continues to look for a new early morning meteorologist to replace Jennifer Lopez, who parted ways with the station after a nearly four-year tenure. Staffer Samantha Davies, who also would like to have the job, is still dispensing highs and lows in Lopez's absence. On Monday's edition, Hayes and Davies bantered a bit about Monday's "hot and sticky" forecast. He should be used to humidity, coming from Atlanta, she told him. "I've heard a little somethin' about that hum-a-did-ity," Hayes cracked. He then chuckled hard. During a getting-to-know you segment in the 6 a.m. hour, Hayes said that he once played football at the University of Texas-El Paso before finishing his undergrad work at Howard University. Ferguson said he looked good in a football uniform before Hayes noted, "That was 50 or 60 pounds ago. I would love to go back to my fightin' weight." He laughed anew, with Ferguson unable to resist adding, "He has such a devilish look in his eyes. And that little twinkle. But you don't come alone." No, he doesn't. Hayes noted that he and his "better half," wife LaTonya, will be celebrating their 20th anniversary in October. Viewers were shown a picture of the beaming couple before Ferguson dutifully read a laud from "The Boss," (vice president of news Susan Tully) from the April 13th publicity release announcing Hayes' hiring. "He has a warm delivery and makes the early wake-up just a little more enjoyable," Tully said. Hayes indeed does seem to have a winning, outsized personality that might wear as well here in time as it apparently did in Atlanta. His sense of humor is further underscored by his Twitter handle, @MORNING MANIAC, which he promoted at the end of Monday's show. "First day on the JOB -- whoo hoo--yo Dave we had a blast--i was a bundle of nerves but my partnr rox!!" Hayes tweeted Monday. Hayes' debut, and the continued presence of Keith Garvin as co-anchor of CBS11's early morning newscasts, mark another breakthrough in D-FW television news. It's the first time that two African-American male anchors are helping to bring early risers their first news of the day in a market where all four major TV news providers -- Fox4, NBC5, WFAA8 and CBS11 -- now have female news directors with the recent hiring of Carolyn Mungo at WFAA8. ***NBC5 early morning reporter Kendra Lyn briefly forgot her new news handle Monday during one of her live Deion and Pilar Sanders "Divorce Drama" dispatches from outside the Collin County Courthouse. "Kendar Oes . . . or Kendra Lyn. Back to you," she said. Lyn arrived earlier this year from WESH-TV in Orlando, where she was known as Kendra Oestrich. 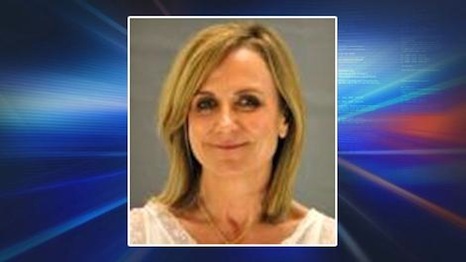 Jane McGarry's mug shot, courtesy of the Dallas County Sheriff's Office, was posted early Sunday evening on WFAA8's website. Longtime NBC5 anchor Jane McGarry and her station so far are declining to officially acknowledge her arrest early Sunday morning for allegedly driving while intoxicated. McGarry, who has no previous convictions or DWI arrests, was freed on bail at 6:45 a.m. Sunday after authorities booked her and took a mug shot. As of this writing, only WFAA8 has reported the story among D-FW's rival TV stations. It originated late Sunday afternoon on The Dallas Morning News crime blog. A call to McGarry's cell phone number, which is on file at unclebarky.com, elicited this response at about 7:45 p.m. Sunday after I identified myself and then asked, "Is this Jane?" "No," said the voice at the other end, which sounded like McGarry's. "It's not Jane McGarry?" she was asked. The woman at the other end then hung up. But an immediate call back to the same number got this recorded message: "Hi, this is Jane. Leave me your number and I'll call you right back." Asked if NBC5 has any official statement on the matter, station vice president of programming Brian Hocker said via email Sunday night, "NBC5 station management is looking into the matter this evening and has no further comment." Meanwhile, news of the arrest has spread to the point where commenters are weighing in on McGarry's Facebook Fan page even though she's said nothing about it so far. Commenter Cathrine Hatcher (which is the way she spells it), says in part, "WE ALL make mistakes. We get to make our mistakes privately. Someone like Jane can't even slip up without the whole world knowing about it. I'm sure she feels TERRIBLE. I know Jane . . . do you?" The only critical comments, from Julie Riddle Caldwell, include her rebuttal that "you guys can rationalize drinking and driving all you want. I am saddened by it . . . You can make a mistake but not when risking the lives of others." According to her arrest report, portions of which are quoted on The News crime blog, McGarry was driving a 2007 Porsche when a state trooper pulled her over on the Dallas North Tollway (around 1:35 a.m. Sunday) after she failed to signal a lane change. The arrest report says that McGarry had bloodshot, droopy eyes, swayed while standing and "used a loud tone of voice when talking," according to The News. McGarry reportedly admitted to drinking three glasses of wine, but refused to take a breathalyzer test. The arrest report also says that McGarry failed a number of sobriety tests, including the "walk and turn," the "one-leg stand" and the alphabet. She was checked into jail around 3 a.m. and released after bonding out almost four hours later, according to The News' account of the official arrest report. 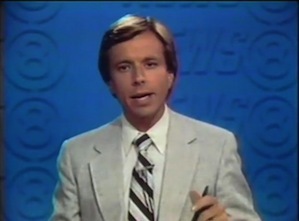 McGarry joined KXAS (Channel 5) as a weekend anchor in 1982 long before the station was bought by NBC Universal and re-christened NBC5. In 1991, she began co-anchoring the 10 p.m. weeknight newscasts, partnering with both Brad Wright and Randall Carlisle before her best known desk mate, Mike Snyder, joined her in April 1992. They endured until July 2009, when Snyder gave way to Brian Curtis before parting ways with the station a year later. McGarry was taken off the 10 p.m. newscasts, in favor of Meredith Land, in February of 2010. She now co-anchors NBC5's weekday 5 p.m. newscasts and also has been the solo anchor of the 6:30 p.m. "DFW Nonstop" on the station's digital Channel 5.2 since May of 2011. "Yeah, change is scary," McGarry told unclebarky.com after her long tenure as 10 p.m. co-anchor came to an end. "But change can be exciting, too. I'm a person who gets bored easily. I need energy, action, all that stuff. For me,this is the beginning of something new. And I'm not B.S. 'ing you here in any way." Thursday's Game 3 demolition at the hands of the Oklahoma City Thunder sent the Dallas Mavericks' ratings on a decided downward spiral as the long night wore on. Stretching from 8:51 to just after 11:15 p.m., OKC's 95-79 rout of the now all but dead defending champs averaged 189,675 D-FW viewers on both TNT and TXA21, which had the homegrown presentation. Crowds peaked at 243,868 on TNT (from 9:30 to 9:45 p.m.) and 237,094 on TXA21 (from 9:45 to 10 p.m.). But by the final 15 minutes of the game, those numbers had dwindled to 135,482 viewers on TNT and 121,934 on TXA21. The combined total game average of 379,350 viewers nonetheless matched the crowd for the Mavs' heart-splintering Game 1 loss at OKC and slightly exceeded the 372,576 viewers for Game 2. Saturday night's Game 4, scheduled for an earlier 6:30 p.m. start, will also be up against the Texas Rangers-Cleveland Indians game on Fox Sports Southwest. Luckily for the Mavs' ratings prospects, Yu Darvish isn't scheduled to pitch until Sunday. Elsewhere on the dial, Fox's American Idol results show nearly matched the combined audience average for Mavs-OKC, drawing 359,027 viewers in the 7 p.m. hour. 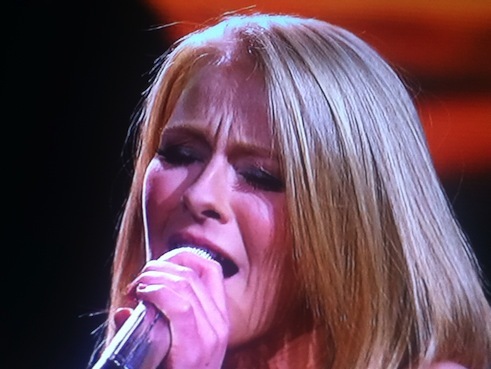 McKinney's Hollie Cavanagh, whose Bottom 2 exiles have become this season's trademark, again lived to sing again and now is in the show's Final 4. CBS' The Big Bang Theory edged the first half-hour of Idol in total viewers but those positions were reversed among advertiser-prized 18-to-49-year-olds. In the Big Four broadcast network universe, the CBS crime combo of Person of Interest and The Mentalist won from 8 to 10 p.m. in total viewers. The 18-to-49 firsts in those time slots went to ABC's Grey's Anatomy and Fox4's 9 p.m. local newscast, which trumpeted its live interview with the ever-available Deion Sanders. In Thursday's local news derby results, CBS11 edged WFAA8 in total viewers but Fox4 had the gold among 25-to-54-year-olds, the main advertiser target audience for news programming. WFAA8 fell to fourth. The 6 a.m. numbers were much better news for WFAA8. Its Daybreak registered its first doubleheader win of the May "sweeps," which still have 14 weekdays to go. WFAA8, defending February sweeps champ Fox4 and NBC5 remain locked in a close three-way fight for early morning supremacy. The Peacock stayed strong at 5 p.m. with twin wins. And WFAA8 likewise swept the 6 p.m. competitions. Absent any competition from the Texas Rangers and still housing a North Texas competitor, Fox's American Idol nonetheless fell well short of hitting a ratings home run Wednesday. The latest 7 to 9 p.m. performance edition drew 304,835 D-FW viewers to win its time slot. But those aren't imposing numbers. And they weren't all that much better than those for CBS' Criminal Minds (264,190 viewers at 8 p.m.) and CSI: Crime Scene Investigation, which won the 9 p.m. hour with 257,416 viewers. McKinney's Hollie Cavanaugh, a member of Idol's Final 5 despite being a recurring member of the Bottom 2, looked to have a decent chance of surviving another week after receiving her best judges' reviews of the season. Still, this prominent local angle doesn't seem to be increasing Idol's ratings strength in D-FW. Instead the show was down 60,966 viewers from the previous week while losing from 8 to 8:30 p.m. among advertiser-craved 18-to-49-year-olds to ABC's competing Modern Family. NBC's Rock Center with Brian Williams also again hit the ratings skids despite its heavily promoted inside-the-White House look at how the killing of Osama bin Laden went down. Despite cooperation from all the prominent players, including President Obama and Secretary of State Hillary Clinton, Rock Center ran fourth in the 8 p.m. hour with just 81,289 total viewers while likewise running out of the money with 18-to-49-year-olds. The Rangers' lopsided 11-5 loss at Toronto Wednesday afternoon drew the team's skimpiest crowd of the season, with 81,289 viewers tuned to the Fox Sports Southwest presentation. Day games are ratings killers on weekdays. In local news derby results, NBC5 and WFAA8 shared the 10 p.m. lead in total viewers, with WFAA8 alone at the top with 25-to-54-year-olds, the main advertiser target audience for news programming. Fox4 reasserted itself in the up-and-down early morning race with twin wins at 6 a.m. And NBC5 swept the 5 p.m. Nielsens. At 6 p.m., WFAA8 ran first in total viewers while Fox4 won among 25-to-54-year-olds. A new May "sweeps" episode of NCIS ranked as Tuesday's biggest gun while the Texas Rangers' rare meltdown in Toronto still had enough juice to beat three network big guns in the 8 p.m. hour. NCIS led off with 426,768 D-FW viewers, with nothing else really close from 7 to 8 p.m. The Rangers, who squandered a 5-0 lead in eventually losing 7-6 to the Blue Jays, then drew 325,157 viewers for the 8 to 9 p.m. portion of a game that ended at 9:04 p.m. with a walk-off home run. Even against a non-marquee opponent, those numbers were strong enough to beat formidable competition in that time slot from CBS' NCIS: Los Angeles and ABC's Dancing with the Stars results show (304,835 viewers apiece) and NBC's The Voice vote-off (257,416 viewers). CBS' The Unforgettable then won at 9 p.m. with 270,964 viewers. For the full game, Rangers-Blue Jays averaged 250,642 viewers, giving Fox Sports Southwest another bounteous night, even in defeat. Among advertiser-prized 18-to-49-year-olds, the Rangers game also was Tuesday's top draw in the 8 p.m. hour, even edging Fox's potent New Girl in the first half-hour. That's remarkable. There's this, too. With NCIS experiencing its usual big drop-off among 18-to-49-year-olds, the 7 to 8 p.m. portion of Rangers-Blue Jays had just enough juice to beat Fox's Glee for the top spot. Doubly remarkable. In local news derby results, the fourth weekday of the 20-day May "sweeps" yielded at least one win for all four major combatants. WFAA8 ran first in total viewers at 10 p.m., but was nipped by NBC5 among 25-to-54-year-olds, the main advertiser target audience for news programming. The Peacock continued its strong push at 6 a.m. with wins in both ratings measurements. The other contenders in this air tight race, Fox4 and WFAA8, shared the silver in total viewers while Fox4 had second place to itself in the 25-to-54 demographic. In another blow to downtrodden CBS11's early morning fortunes, CW33's comedy-laced Eye Opener took the No. 4 spot from 5 to 6 a.m. among 25-to-54-year-olds and was close behind CBS11 in the 6 a.m. hour. And among 18-to-49-year-olds, Eye Opener bested CBS11 at 5 a.m. and tied the station for fourth place at 6 a.m. The early evening local news firsts were split four ways. CBS11 won in total viewers at 6 p.m., with Fox4 and WFAA8 tying for first among 25-to-54-year-olds. NBC5 topped the 5 p.m. field in total viewers while Fox4 added another 25-to-54 gold. Monday night's programming roster wasn't for the faint of heart. Ratings magnet Yu Darvish's latest successful outing for the Texas Rangers, an early-starting 4-1 win at Toronto, clashed with ABC's Dancing with the Stars, NBC's The Voice, CBS' potent sitcom lineup and the very early stages of the Dallas Mavericks' second playoff game at Oklahoma City. So let's see how it all shook out. Rangers-Blue Jays, which ran from 6:09 to 9:09 p.m. on Fox Sports Southwest, averaged 277,738 D-FW viewers with a peak crowd of 413,220 between 8:15 and 8:30 p.m.
That beat the Peacock's 7 to 9 p.m. edition of The Voice (an average of 237,095 viewers) and CBS' entire quartet of sitcoms as well as Fox's Bones and House. But the 7 to 9 p.m. edition of Dancing with the Stars ruled with 379,350 viewers during those hours. That portion of the Yu-fueled Rangers ran a very respectable second with 325,157 viewers after a slow 6 to 7 p.m. start during which many prospective were just getting home. But could anything beat the dual TXA21/TNT presentation of the Mavericks' latest heartbreak, last second loss to the Thunder? The game began at 8:49 p.m. and ended at 11:34 p.m. TNT averaged 189,675 viewers while TXA21's homegrown telecast fared much better this time with 182,901 viewers after getting trounced by the ESPN telecast on Saturday night. Add them up and that's an average of 372,576 viewers for Mavs-OKC, which is almost 100,000 more viewers than Yu tube drew. But both bowed to ABC's Dancing with the Stars. Let's move to the advertiser-prized 18-to-49 scoreboard, where extra mustard is applied. The Mavs were top dogs here, but the Rangers and FSS gladly will settle for an overall second place finish ahead of both Dancing and The Voice. Yu's presence and his appeal to younger viewers were especially striking from 7 to 9 p.m. opposite ABC's and NBC's heavy hitters. Let's look at the 18-to-49 numbers during those two hours. CBS' most popular 18-to-49 draw, 2 Broke Girls, had 112,081 viewers in this age range between 7:30 and 8 p.m.
Mavs-OKC racked up 112,081 viewers on TNT in the 18-to-49 demographic and added another 89,664 for the TXA21 telecast. 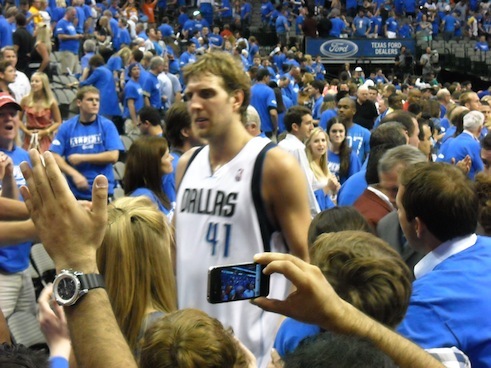 The total of 201,745 easily makes the Mavs Monday's biggest winner among the viewers advertisers like best. It's now time to finish up with the local news derby results, where CBS11 bucked WFAA8's lead-in advantage from ABC's Castle to win at 10 p.m. in both total viewers and 25-to-54-year-olds, the main advertiser target audience for news programming. NBC5 continued to put up a strong fight at 6 a.m. through the first three weekdays of the May "sweeps," winning in total viewers before Fox4 nipped WFAA8 among 25-to-54-year-olds while the Peacock finished a close third. CBS11 remained on a respirator in the early morning. From 5 to 6 a.m. in fact, it barely beat CW33's Eye Opener among 25-to-54-year-olds while losing to Eye Opener in the 18-to-49 demographic. That. Is. Not. Good. WFAA8 claimed Monday's other golds with sweeps at both 5 and 6 p.m. The ABC station may be regaining some strength in these time periods after losing across the board in the February "sweeps." Chimps and puppets are still in play as WFAA8's slap-happy campaign for Daybreak works a house band into the mix. Co-anchor Ron Corning, focal point from the start, this time heralds a four-piece "Daybreak Band" that's supposed to fire off an old-school rimshot whenever something funny happens on the show. Interim co-anchor Alexa Conomos, filling in at the desk while Cynthia Izaguirre is on maternity leave, adds her own zinger after Corning gooses the band to react to humorous moments in traffic and weather. Not funny, she says, before tacking on a rather acidic "Ya moron." Band members then lay on an industrial strength rimshot while the hapless, hammy Corning tries to quiet them. It should be noted that Fox4, the defending February "sweeps" early morning champ, has its own real-life "Good Daze" band fronted by meteorologist Evan Andrews on drums, traffic reporter Chip Waggoner on guitar and fun-fun Fiona Gorostiza supplying the lead vocals. In the deadly serious early morning ratings wars, Fox4 is trying to fight off what so far looks like a two-pronged May "sweeps" threat from both NBC5 and WFAA8, which long has been in third place but is surging in recent months with its series of Corning-centric promos. Here's the latest, with Mugsy the gassy monkey perhaps waiting in the wings.